I wanted to take a minute to provide an update to our readers about the Medicaid payment reform initiative. As some of you know, the Arkansas Psychological Association (ArPA) has had a representative present on the core workgroup that meets regularly and serves as consultants to DHS in the design of the “episodes of care” packages and in the reforming of Medicaid payment structures. Below are ten summarizing points that will hopefully explain the upcoming changes in medicaid. There are still many unanswered questions, but this is my understanding of what is being proposed. 1. In a nutshell, Arkansas Medicaid is revamping the way it reimburses, the rates it reimburses, and services that are billable through Medicaid. It is exploring national averages for payments and offering payment for many services that it currently does not reimburse but that research suggests are effective, such as psycho-education and parent education. 3. Medicaid is switching from a “fee for service” model to “episodic payment packages” for its more expensive mental health problems. In this switch, providers and agencies who treat patients more efficiently than the average, will receive a share of the financial gain. Those who’s average cost per client group (grouped by diagnosis) is higher than the state average will share in the financial risk. As you may know DHS has already implemented an episodic payment structure for ADHD (July 2012) and ODD (Oct. 2013), and has designed packages for Comorbid ADHD / ODD, which will be presented to legislators in the second quarter of 2014. ArPA was involved in the design of all three models. My view of these three models is that the ADHD model will probably work sufficiently. It provides ample range of services and may be financially beneficial for a lot of providers, but may be slightly restrictive in the amount of funds allowed for treatment. The ODD and Comorbid packages are generous in the services offered and designed to reflect what research suggests is good treatment for these conditions, such as family therapy, teacher consultation, parent education, and parent training. 4. Starting Janurary 1, 2014, Medicaid patients are being assigned to a Patient Centered Medical Home, or PCMH, who will be reimbursed not only for providing medical services but also for managing and coordinating services provided by other clinicians, such as psychological or speech therapy. The PCMH will most likely be the patients current PCP. 5. All patients will maintain their PCMH while still receiving outpatient care to private practices, local clinics, or community health centers, but hopefully with increased communication between providers, since the PCMH will be reimbursed for coordinating care. The PCMHs will function like case managers and will be reimbursed at a rate between $1 and $30, for each patient per month. The PCMH application process has already opened, as of January 28, 2013. 7. Medicaid patients will have access to some Tier 1 services without obtaining prior authorization, although after a certain limit is reached, providers will have to submit an authorization request, much like with private insurers, to access the remaining service limits for that Tier. Those needing more services than allowed in Tier 1 will undergo an “independent assessment” to assess the level of service needed. 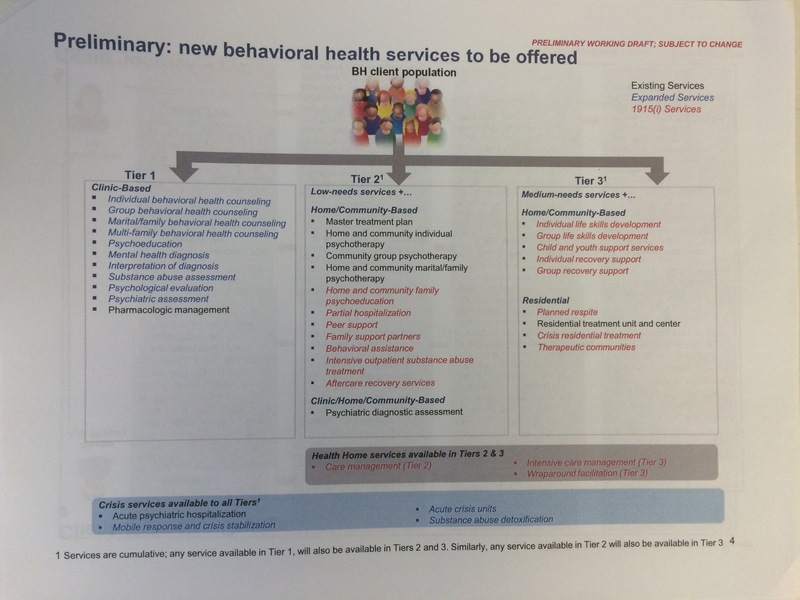 If the assessment indicates a higher need, the patient will be assigned to a Behavioral Health Home (BHH), who will develop a comprehensive care plan that coordinates all the behavioral health services needed. They will progress to Tier 2 or 3 level of services. The Independent Assessment will be conducted by a contracted organization who provides assessment only, no treatment, in order to keep the assessments unbiased. The assessment will measure functional impairment, not diagnostic clarification. DHS released the Request for Proposals (RFP) for this statewide contract, but rescinded it after the launch date was delayed. 8. Most community providers will function under Tier 1. Tier 1 services include individual therapy, group therapy, marital/family therapy, multifamily group therapy, psychoeducation, mental health diagnosis, interpretation of diagnosis, substance-abuse assessment, psychological evaluation, psychiatric assessment, and pharmacological management. All services will have a limit. The larger organizations, with hospitals, day treatment, and substance abuse treatment, will likely function as Tier 2 and Tier 3 sites. They may also apply for status as a Behavioral Health Home. 9. All patients, regardless of Tier, will have access to Crisis Services and hospitalization. 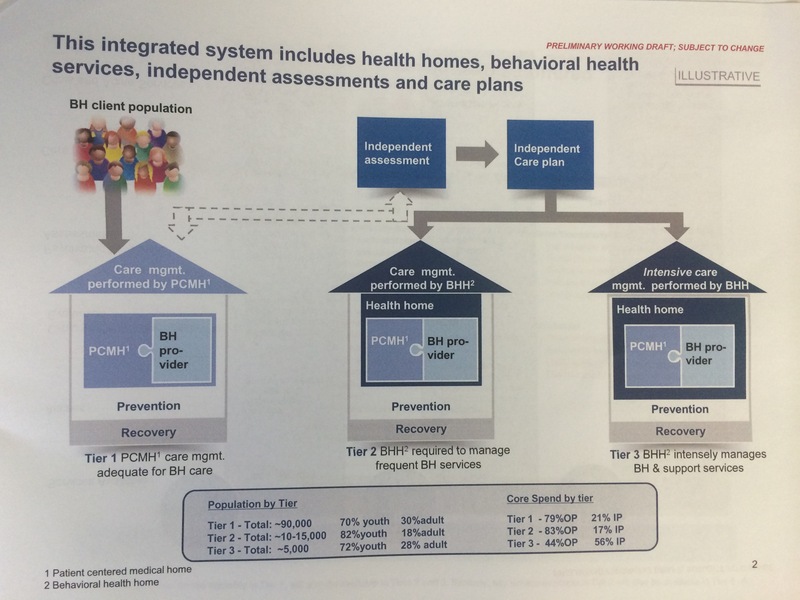 Although hospitalization will put in place an immediate referral for the Independent Assessment, placing them in Tier 2 or 3, and assigning them to a Behavioral Health Home (BHH) to coordinate care. At such time, the patient will have a PCMH to coordinate medical needs and BHH to coordinate mental health needs. DHS will release criteria for agencies to apply for BHH status. 10. DHS is conducting a Pilot Study of the independent assessment process, before officially putting it in place. They have chosen the measures to assess functional impairment/treatment need, which were developed by InterRAI, (see Interrai.org). They recruited around 90 individuals from 30 mental health agencies across the state to act as Independent Assessors. The data they collected with the assessments will be compared to Medicaid Claims data and a sizeable sample will be reviewed by a panel of local experts. The info from these three sources, that is: the assessment, the claims data, and the experts, will be used to develop a method (and data algorithm) for predicting the level of treatment needed (Tiers 1, 2, or 3). For the pilot study, they selected 1200 Medicaid patients, 600 children and 600 adults. The pilot assessors were in training Jan 28 through 31. They were provided laptops and received detailed training and ongoing consultation in the use of the InterRAI instruments and the evaluation process. The local experts were also in attendance and received additional training on the review and classification of cases. The panel of around 30 experts are currently reviewing 20-30 sample evaluations per expert to develop a valid algorithm for placing patients in the correct Tier. Each of the evaluations selected is chosen randomly, and reviewed by two panelists before assigning to a Tier. The DHS committee charged with making reforms appears to remain open to ideas, concerns and discussion. They have a large team at DHS and an outside organization, the McKenzie Group on the project. They hold public forums for anyone interested in attending, in addition to our core workgroup meetings and other focus groups among stake-holders.